Thousands of paper lanterns lit up the night sky above a university campus in the Philippines as a crowd gathered to attempt a new world record. The organisers, a Thailand-based organisation called the Middle Way Meditation Institute, said 15,185 lanterns were released in total. It said Friday's event celebrated "world peace through meditation". Local media reported that a Guinness World Records adjudicator had confirmed that the current record had fallen. 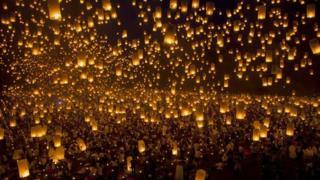 The record has been held by Romania, with 12,740 lanterns released in a single event in June 2012. Many of the lanterns had the words "world peace through inner peace" printed on their sides. They were released from a football field at the University of the Philippines Visayas, in the central province of Iloilo. Leaders from Buddhism, Christianity and Islam were present as an estimated 10,000 people lit and released the lanterns, local media reported.